Irving J. Good received degrees M.A., Ph.D., Sc.D. from Cambridge University, and D.Sc. from Oxford University. In World War II he was a cryptanalyst at Bletchley Park helping to break the German Naval Enigma and a higher grade system in which Hitler communicated with his generals. 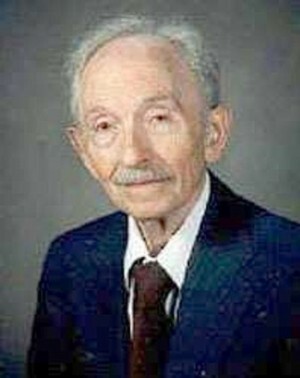 From 1967 to 1994 he (Good, not Hitler) worked at Virginia Tech in the Statistics Department. He officially retired in 1994. He is now University Distinguished Professor Emeritus of Statistics. He published more than 2000 technical papers. His first book, Probability and the Weighing of Evidence (1950), was the first book in English on subjective Bayesian statistics. He was the General Editor of The Scientist Speculates: An Anthology of Partly-Baked Ideas (1962) of which there have been French and German translations. His book Good Thinking, the Foundations of Probability and its Applications (1983) contains a selection of Good's more philosophical and less mathematical articles.